We must polish our shoes, not because the regulation states it, but for dignity and propriety. We must walk erect, without dragging our feet, not in homage to Prussian discipline but to remain alive, not to begin to die. Pair of well worn toddler's shoes inscribed "Der Erste Schuh" [The First Shoe] brought with 3 year old Susanna Gibian and her father Otto when they fled Vienna, Austria, for the United States in September 1938. 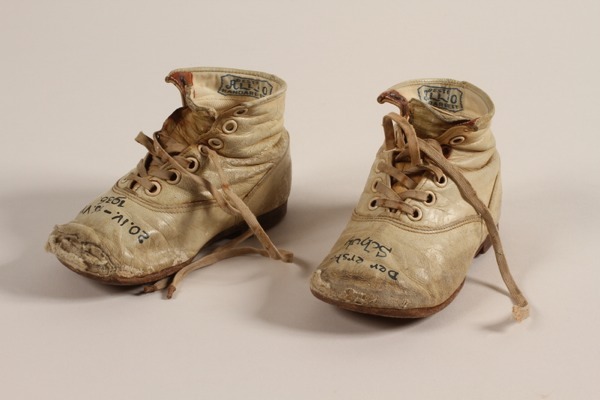 The infant's shoes were donated to the United States Holocaust Memorial Museum in 1994 by Jill Shellow, executor for the Estate of Irene Rosenthal Gibian, the stepmother of Susanna Gibian.